I have been reading all over the net about Air Cannons and the startling effect that they have and I decided to build one. 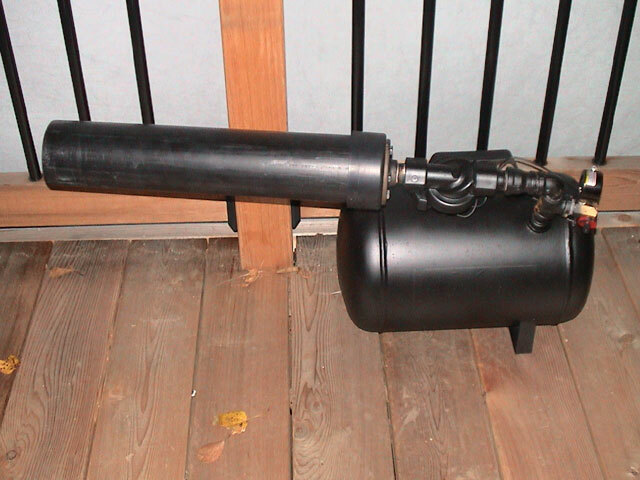 An Air Cannon is a large air tank connected to a valve which allows you to exhaust the pressured contents of the tank instantly creating a large booming noise. This is the first pneumatic prop that I have made and I am pretty happy with the results. There are many different ways to build these but here is how I built mine. First empty any pressure that may be in the tank from the testing at the factory. It won’t be much but bleed it off all the same. 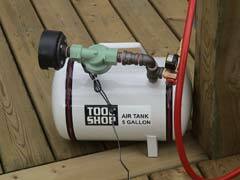 Remove the air pressure gauge and valve from the tank and set the unit aside as you will need it later. Clean the threads in the hole in the tank and screw in one of the 1/2″ x 2″ pieces of pipe. Remember to wrap all threaded pieces with plumbers tape. Next, screw on the “T” fitting tight with the wrench so that the middle port of the “T” faces the rear of the tank. In the top of the “T” insert the “L” fitting and tighten so that the open port of the “L” faces the front of the tank. Insert your second 1/2″ x 2″ pipe into the “L” and tighten. Onto that pipe attach the 1/2″ x 3/4″ adapter (tighten). Insert you first piece of 3/4″ x 2″ pipe (yes…. tighten it). 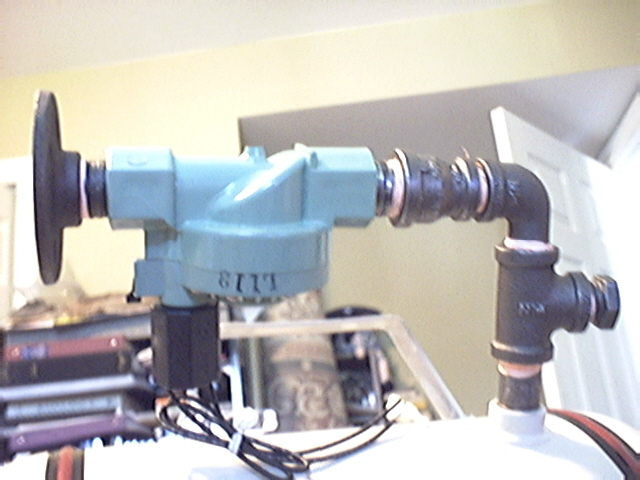 Take the brass valve/gauge that came with the tank and screw it into the middle port of the iron “T”. Into the port on the valve insert a quick connect air fitting. *** the advantage to using this gauge is that it has an over pressure blow-off valve that will blow when the tank exceeds it’s pressure rating. This could be a good thing one day. Attach your ABS end cap to the iron flange using 4 small nuts and bolts. Into this end cap you can slide your 3″ ABS pipe (don’t glue it in or you will lose the choice of using it or not). That’s about it! Your done! I tested this at 80 PSI (I haven’t gone higher yet but I have no reason to believe it can’t handle 125 PSI since the valve is rated for 125 PSI). Below are two tests using the pipe and not using the pipe. I like the sound of both but the pipe gives it a deeper blow sound.